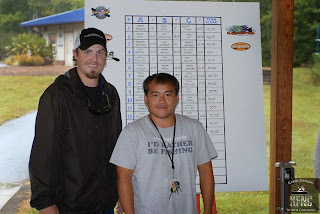 This past weekend I had the pleasure of competing in the first ever Triad Area Kayak Anglers (TAKA) fishing tournament. 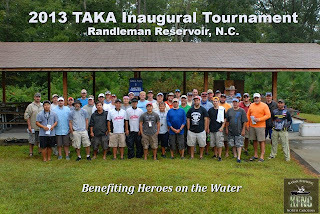 TAKA is run by a handful of guys from the Triad area who are super passionate and dedicated to the sport as well as just flat out good guys. They haven't been around long, but I know they were working super hard to make the event a success and they did just that. 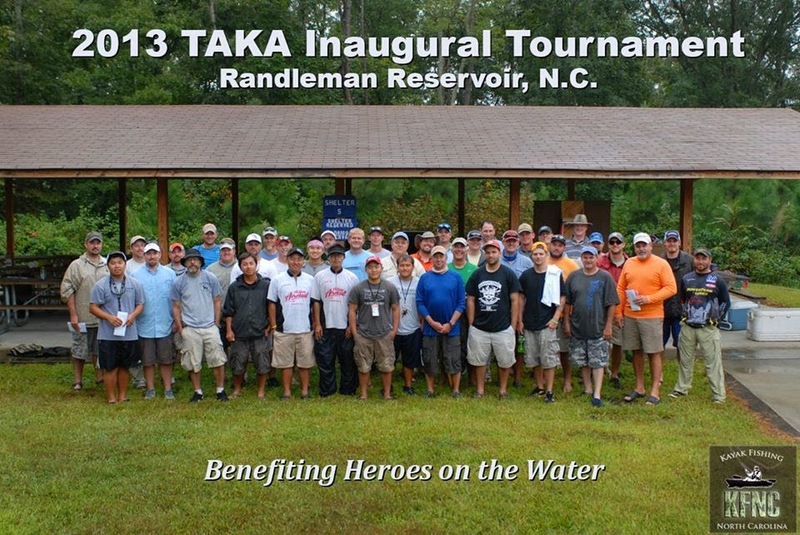 They teamed up with Heroes on the Water (HOW), a charity that gets vets out on the water and, per their website, helps wounded warriors relax, rehabilitate, and reintegrate through kayak fishing and the outdoors. The format was unique and there were two parts to it. 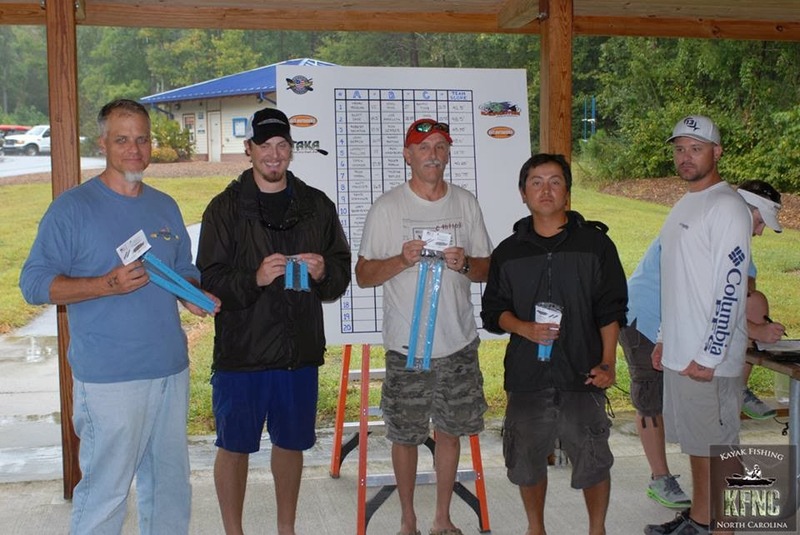 The first was a random team format where anglers were placed on teams of 3 with teammates drawn from a hat. The second component was an individual, one fish, big fish format. All in all, 41 talented anglers came out to visit, compete, and share a few laughs. Although I caught plenty of fish, the big bite escaped me. Here is a recap of a very fun, yet challenging experience. Randleman Lake is only about an hour from my house, yet I rarely fish it. In fact, looking back at my fishing logs, all of my fishing trips have been on rivers since the Duke-UNC Charity Tournament during the first week of April. But, this would make my third trip to Randleman over the past 3 years. The other two were full of highs and lows. During both, I launched at the "bass boat" launch instead of the electric only/kayak area at Southwest Park, which was the launch for the TAKA tourney. I have 2-3 productive areas within a couple miles of the bass boat launch that I tend to cycle through and fish thoroughly. Those spots helped me win the NCKFA Battle for the Boro Fly Division in 2012 and put me in the top 8 of the general division the year before - although I had a fish that would have won, break my heart by spitting the hook next to the boat. However, those areas were way too far to paddle to from the Southwest Park launch, so they were not going to work. As always, I brought up Google Maps and started doing some virtual scouting. The north side of the lake was littered with wood. It had a defined channel, some flats, sparse grass, and some rocky outcrops. It looked like a kayak fishermen's paradise. I knew from recent reports that most folks would stay fairly close to the launch and throw plastics and squarebills around wood cover. And as with any one-fish event, I knew it would take a bit of luck. My plan was to make a long paddle - in the 4-4.5 mile range - up into the lower section of the Deep River, where it feeds into the lake. On the map, it looks insanely good. But I had one reservation. In all of the fishing reports I had read about the upper half of Randleman, no-one ever mentioned fishing up that far. Part of me was hoping it was due to laziness because of the long paddle, but I noticed a string of buoys on the map and that worried me that maybe it was off limits. I prepped my gear the night before and tied on a medium running balsa crank from CP Baits, a Lucky Craft squarebill, a Deep Creek Lures Super Razor Beetle on a flipping set-up, and a weightless worm. I also made sure my buzzbaits were ready to go, because I had a suspicion they would factor into my plans before it was said and done (spoiler - they didn't). I loaded up all of the gear and put the boats on the roof. The next morning I was up around 5 AM and on the road. The drive was easy, particularly after a stop for some caffeine and a blueberry fritter. There was already quite a line of folks when I showed up around 6:30 AM - including a handful of locals in jon boats and yaks. Bill Kohls pulled in shortly after me and we got everything unloaded, mingled amongst our fellow competitors, and got registered by the TAKA guys. I had joked with Bill and good friend Eric Boyd how cool and crazy it would be if we were all drawn on the same team. After doing some quick math, let's just say that the odds were not with us. My name was drawn first...well sort of. The name drawn was Drew Harrison, who was on an initial sign-up sheet, but didn't actually make it to the event. It was discerned that I was indeed "Drew Harrison" and so I was on Team 6. My teammates were Jim Jenkins of Yakin' Around and Roger Marvin. I had met Jim at the Carolina River Fishing Rodeo in May/June and Roger was from Greensboro and had fished the lake a few times before. I knew it was a solid team, so my fingers were crossed that we would get the bites we needed to be competitive. Our game plan was to simply keep in touch via text message throughout the day and let each other know if we found a successful pattern or caught a giant. We got situated and at 8 AM we had a shotgun start. As with any shotgun start, there were guys paddling (and pedaling) like crazy, weaving in and out of the way, colliding, and leaving wakes. I managed to make my way toward the front of the pack with Bill and Eric not far behind. Soon I had nothing but open water in front of me as the Stealth was cutting the wind like a machine. The lake looked just as good in person as it did on the satellite imagery and I had to resist the urge to stop and fish. After paddling into the start of the river arm, I had about 3 miles to go to reach the area I wanted to fish. But since I was nervous about the buoys, I decided to stop and ask a jon boat fisherman about them. My heart sunk as he confirmed my fears - the area was off limits. I paddled over to a rock bluff and started cranking while I collected my thoughts. I was kicking myself for not bringing my depth finder since I figured I wouldn't need it in the river. Now, it would have been invaluable for finding deep drops and structure. Bill and Eric were also going to make the run with me, so I talked with them. Since the area we were in was packed with yaks and jon boats, we decided to fish our way back out to the main lake and toward the bass boat area below the highway 62 bridge. Although that was also a big risk, because there was a 100+ boat tournament going on, on that end of the lake as well. As I meandered back to the main lake, I caught a couple short fish on a weightless worm that I didn't even bother to measure. After a few more small bites, I knew it was time for a change and in particular, that I needed to get out into the wind and use it to my advantage because there were pods of bait everywhere. The problem was that I also had to stay fairly shallow because I wasn't able to efficiently find key deep spots without electronics. Bill and I began paddling toward the highway 62 bridge, stopping just before it to hit some good looking areas. There I caught a 12" bass on the CP crank, a 13.75" bass on a worm, an 11" bass on a buzzbait, and a 12.5" fish again on a worm. It was looking like a typical Fall bite - known to many as trash fishing. Trash fishing is when there is no real pattern and is particularly prevelant on those cool fall days sandwiched between storm fronts. The nearly full moon wasn't helping our cause either. It would mean that I would have to throw a lot of casts with a lot of baits at a lot of different types of cover, but that I would almost certainly grind out some fish. The rip-rap around the bridge was already being fished by bass boats, so we continued on to a creek arm Bill knew about. We paddled toward the back and found a couple of beaver dams, an old cement structure, and tons of wood cover. The bite started slow in the creek arm, but we caught a few short fish. Then, just as we were starting to worry that we were fishing too shallow, Bill hooked up with a lanky 18" bass on a creature bait and I followed up with a 15.5" bass caught on a worm. Then the wind picked up and the bite picked up quickly for me. I landed a 16" bass on a flipping bait, a 16.5" fish on a crank, another 16-incher flipping, a 15" fish on a squarebill, and plenty of fish in the 12"-15" range on a variety of baits. About that time I got a text from Jim. The bite was slow for he and Roger, but they both caught a few fish. I think our team total was around 38.5" at that point and I knew it would take over 55" to win, but it was only around 11 AM, so we had plenty of time to upgrade. I passed along that my best fish had come on chartreuse and white cranks and flipping and went back to work. Bill and I fished deep for about thirty minutes while we let the area rest before another pass. I managed a couple short fish around rip-rap, but they wouldn't help. A second pass through the area wasn't particularly helpful for me either as I only managed a couple more short fish on crankbaits. Bill, had a little more luck...kind of. He nailed another 18" bass on a spinnerbait cast to an isolated stick-up. It was a solid second fish, one I wish I would have hooked up with, but it didn't upgrade his length from his earlier 18-incher. It was about 1 PM and we decided it was time to start making the run back toward the ramp, which was a few miles away. I decided to paddle out to some blow downs I noticed on the way in while Bill stayed behind to crank some other areas. I went through a few trees without a nibble before coming to the deepest tree. It isn't rocket science that often the deepest trees have the most and biggest fish. Sure enough, I flipped my bait into the tree and BAM - I knew I had a good fish. I muscled him out of the jungle of sticks with my Carolina Custom Rods Finesse Special and got him in the net. The fish had a huge gut, but wasn't extremely long. He measured right at 17.5" on the board and was a nice upgrade for me. On the next cast to the same tree I caught another bass, which fought like a freight train, but only measured 16". Right about then I was wishing it was a 5 fish limit - or at least 3. I wanted that 20" fish bad and I was working hard to get it. I was paddling as hard as I could between pieces of cover, only slowing down enough to make a cast or two at each. I caught a couple more short fish before coming to a cove that looked good and also a little eery as an afternoon storm rolled in on the horizon. I flipped my bait toward the base of a tree and on the second lift of my rod I felt it snag in some brush. I began applying pressure with my rod and the brush pulled close to the surface, but the bait did not dislodge. As I shook my rod, the bait would flap in and out of the water. Suddenly, a bass erupted on the bait and looked to be at least 4 lbs. But it only swiped at it and the fish never got hooked. I lost another bite that felt solid flipping a downed log nearby and caught one short fish that would close out my day. Reports back at the ramp were mixed. Most folks found the bites hard to come by and reported measuring fish in the 10"-16" range. I thought for sure there would be a few caught over 20", but the weather and heavy traffic denied anyone from breaking the 20" plateau. Big fish for the day went to Vinny Ferreri of Charlotte with a 19.5" bass. I believe 2nd and 3rd place tied with 19.25" between Cha Xoing and PC Hawj. My 17.5" bass tied with a couple other anglers for 9th place. My team ended up with 40.25". I am not sure what place we were in, but somewhere in the middle of the pack. The first place team had 54.5" and consisted of Joey Benevenia, Cha Xoing, and Cory Dreyer. 2nd place went to Joey Sullivan, Luke Breakfield, and Bill Kohls who combined for 51.75". 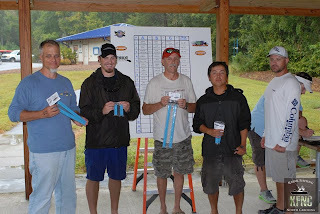 3rd place had 48.5" and consisted of Scott Inge, Joe Angelcyk, and Yang Her. Then the TAKA guys raffled off all sorts of goodies from sponsors like Get:Outdoors, YakAttack, and others. We also got to chow down on some tasty burgers and hot dogs grilled up by the ladies of TAKA. 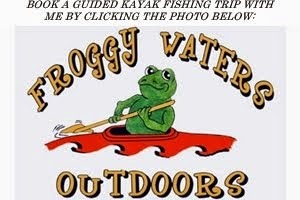 Mike Yang won a guide trip I donated on behalf of Froggy Waters Outdoors. I think Mike and I are going to chase some smallies either this fall or next spring, but the trip is still in the planning stages. And I won a set of YakAttack Gear Trax, which I have been eyeing for a while. The best part of the day was that $460 had been raised for HOW from the event. On top of that, there was a $500 donation made by Green Ford, so the NC HOW chapter walked away with nearly $1000. That is simply awesome! Reflecting back on my day, I guess I shouldn't be too bummed out. I knew I would need a little luck and it just never came. But I caught around 20-25 fish on water I had never seen before in tough conditions, so I that is a minor victory. I also ended up with a three fish limit of 50.5" and a five fish limit of 82.75", which I think would have been pretty competitive if the format were different. I do wish I would have pre-fished. That way, I would have known the Deep River portion of the lake was off limits and could have focused my efforts and planning elsewhere. In fact, there was one specific pattern that I think would have been very productive for bigger bites, but I wasn't prepared to fish it and didn't have the gear and electronics necessary to do so. I also would have taken more of a run and gun approach. Over the course of the day, I was able to hone in on very specific types of cover where I was consistently getting bites. This helped to eliminate a lot of water that looked decent, but it took too long to figure that out and only impacted the last couple hours of my day. I was also really happy with how well the MK Stealth 12 did. 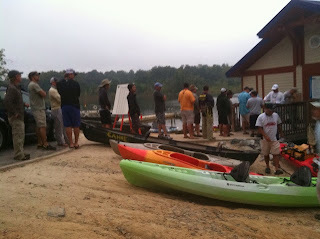 It was as fast or faster than all of the other boats at the shotgun start - including some of the pedal crafts. And I was extremely impressed with my new, white model, crankin' stick from Carolina Custom Rods. Paired with a Revo STX, it is insanely light and sensitive. The white CCR cranker looking super good...and it fishes even better! A huge congrats to the winners, who did an awesome job on a tough day. Also, major props to the TAKA crew who put on a fantastic event. I think everyone came away thoroughly impressed, had a lot of fun, and will be back to do it again next year. Until next time, tight lines!